The fastest way to start listening is to subscribe to The PM Podcast in a Podcast App on your phone. So click on "Free on Android" if you use an android phone/tablet or select "Free on iTunes" for your iPhone/iPad. And if that seems too complicated, then simply click 'Play' on any free podcast episode on this website and earn your PDUs that way. 5.1. Why does The PM Podcast qualify for PDUs? 5.2. How do I subscribe to The PM Podcast? 5.3. How do I claim PDUs from The PM Podcast? 5.4. How do I document the episodes I listened to and PDUs earned? 5.5. How do I claim PDUs on the PMI website? 5.6. How many PDUs can I claim if an episode is not 1 hour long? 5.7. How do I know how may PDUs to claim for each episode? 5.8. How do I know which PMI Talent Triangle Skill Area to use? 5.9. Why is The PDU Logfile in MS Excel, but the Episode Spreadsheet is a Google Sheet? 5.10. I only need another 13 PDUs right now. What do I do? 5.11. Can I claim more PDUs if I get the paid Premium Subscription? Download The PM Podcast PDU Logfile (XLSX) and track each episode you listen to. The better you document your learning activities the more you can give evidence to PMI that you have indeed subscribed and listened to The PM Podcast during an audit. There are many activities through which you can earn earn PDUs. The PM Podcast is an "Education" activity in the category of "Online or Digital Media". PMI states that "Qualifying activities must be relevant to PMI Talent Triangle skill area topics, meet a specified purpose, and use knowledgeable resources". The PM Podcast meets these requirements fully. You can claim up to 60 PDUs from listening to The PM Podcast, as long as you meet the minimum of 8 PDUs for each of the talent triangle skill areas. Please note that every PMP is subject to audit during the PDU submission process and that you may have to show in exactly what way you have earned all of your PDUs. PMI reserves the right to reject some or all of the PDUs that you claim. In case you are audited PMI may ask for "evidence supporting your reported learning, including notes from and dates of activities conducted." Why does The PM Podcast qualify for PDUs? The Continuing Certification Requirements (CCR) Handbook contains a section on "Ways to Earn PDUs". Here, "Online or Digital Media" - which includes podcasts - are explicitly mentioned as a qualifying activity. Therefore, The PM Podcast qualifies. Additionally, The PM Podcast is relevant to PMI Talent Triangle skill area topics, meets a specified purpose, and uses knowledgeable resources. How do I subscribe to The PM Podcast? Once installed simply click on the "subscribe free" button at the top right. How do I claim PDUs from The PM Podcast? Advantage: You provide detailed information about each PDU / each episode that you submit. PMI receives your claims separately and in detail. Disadvantage: You have to input a lot of episodes separately in order to claim 60 PDUs. It's a lot of work and takes a lot of time. Advantage: Much simpler to do because you only have to input one single PDU claim for listening for all of The PM Podcast over the course of the year. Disadvantage: You are more likely to be audited. PMI may ask you to provide additional documentation to support your claim. It is therefore imperative that you keep a lot of notes when listening. We have discussed these two options with PMI's CCR Product Manager and it was confirmed that both options are valid, but with the caveat that for Option 2 "Claim Everything" PMI may ask for additional evidence / documentation to support your claim. Keep good notes! How do I document the episodes I listened to and PDUs earned? 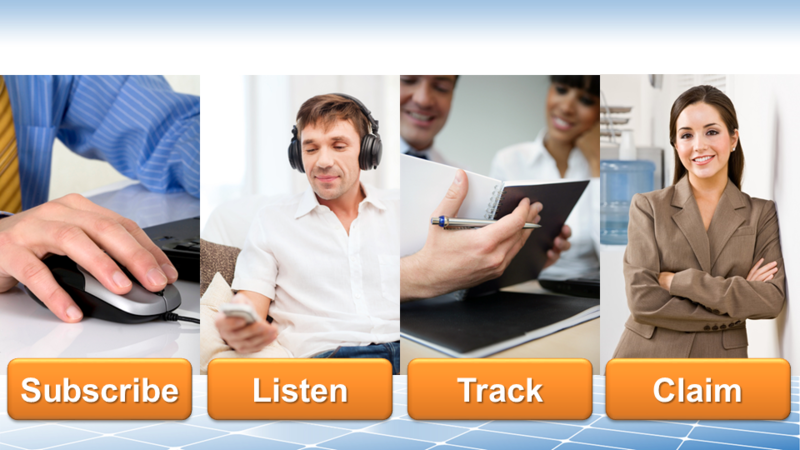 Download the PDU Logfile (XLSX) and track each episode you listen to. 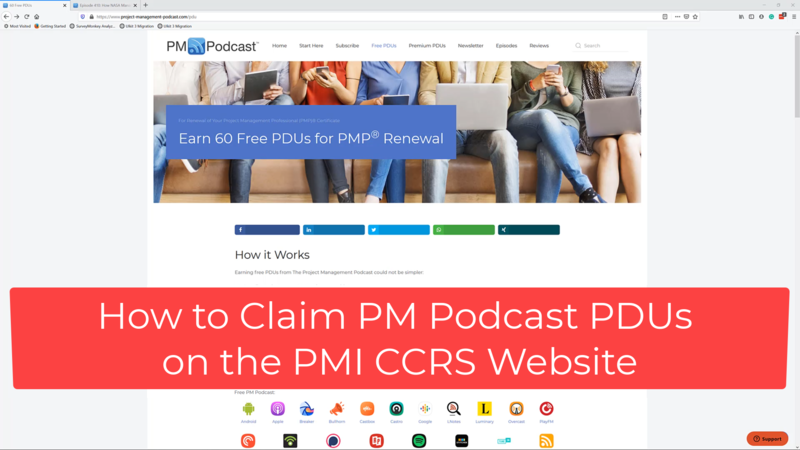 The better you document your learning activities the more you can give evidence to PMI that you have indeed subscribed and listened to The PM Podcast in case your PDU claims are audited. How do I claim PDUs on the PMI website? Provider "The Project Management Podcast"
You have to manually type this name / text into the field. It will not auto-fill. Ignore the drop-down list with suggested provider names. "The Project Management Podcast"
Ignore the drop-down list with suggested provider names. Provider ID Not required. PMI does not require podcasts to have a provider ID. PDUs are still valid. Not required. PMI does not require podcasts to have a provider ID. PDUs are still valid. Title Copy/paste episode title from website "The Project Management Podcast"
Description Copy/paste show notes from website Write a text indicating that you have listened to x-number of episodes of The PM Podcast in the past x-number of months/years, and you are therefore claiming the total number of PDUs accrued for this learning activity. Also mention that you have maintained a separate documentation in which you kept track of dates on which you listened to each episode as well as learning notes. PMI will first send you a confirmation that your PDU claim was received and is under review. Once approved you will receive a second notification email that the PDUs claimed have been added to your account. How many PDUs can I claim if an episode is not 1 hour long? Fractions of PDUs also may be reported in quarterly increments. This means that if you spent 15 minutes participating in a qualifying PDU activity, you can report 0.25 PDUs. If you spend 30 minutes in a qualifying PDU activity, you can report 0.50 PDUs. How do I know how may PDUs to claim for each episode? Take a look at The PM Podcast Episode Spreadsheet... This Google Sheet contains all episodes including information about how many PDUs to claim. How do I know which PMI Talent Triangle Skill Area to use? PMI has defined three skill areas for the Talent Triangle: (1) Technical Project Managenent, (2) Leadership, and (3) Strategic and Business Management. The PM Podcast Episode Spreadsheet contains our recommended skill area. We even use the same colors in the spreadsheet as PMI uses on their claim form. Why is The PDU Logfile in MS Excel, but the Episode Spreadsheet is a Google Sheet? We did a survey and asked our listeners what format they prefer for the logfile. 647 listeners responded, and 372 listeners (57.6%) said that they wanted the logfile in MS Excel. We decided, however, to publish The Episode Spreadsheet as a Google sheet because it gets updated several times a month and it's easier for us to do that with an online sheet. I only need another 13 PDUs right now. What do I do? That's not a problem: Subscribe to The PM Podcast, download and listen to our episodes, track everything in the PDU Logfile, and keep going until you can claim 13 PDUs. But don't stop now! Keep your subscription going and keep listening. Remember... You will need another 60 PDUs in your next renewal cycle. Can I claim more PDUs if I get the paid Premium Subscription?